Many people who see others working with exotic pets (and getting paid to do so) ask the same question, "Do you need special training to do that?" but the answer to that question can vary depending on what job they are talking about. Many careers exist that enable you to work with exotic pets (not exotic animals that aren't pets such as zoo animals) and while some require specialized training others do not. The veterinary profession is drastically different than the human medical field since veterinarians are legally allowed to work on any species of animal and any field of medicine (orthopedic, dentistry, etc.) with the same degree. Once a veterinarian has completed their 8 years of college (4 in undergraduate college and 4 in veterinary college) they must pass the national test to grant them their veterinary license in the United States (called the North American Veterinary Licensing Examination or simply the NAVLE). Depending on which state the vet wants to work in they must then pass the state examination in order to be able to legally practice veterinary medicine. Each state has different tests and fees and the license requires a certain number of continuing education credits in order to be renewed each year (these credits are earned by attending conferences, lectures, etc.). Once a veterinarian has gone through all of this schooling and testing they may then provide veterinary care for dogs, cats, farm animals, exotic pets, and more. Some veterinarians choose to further their training by becoming specialized in a specific area of interest but they are not required to do so. For veterinarians that want to specialize in exotic pets there are several specialties that exist under the umbrella of the American Board of Veterinary Practitioners (ABVP). These exotic pet specialties include avian (birds) practice, exotic companion mammal (primarily pocket pets) practice, and reptile/amphibian practice. The process to becoming certified in one of the ABVP specialties involves a number of things including case studies and another test to prove advanced knowledge. Exotic pet vets that have achieved their specialization in one of the aforementioned specialties is one that you should be able to trust caring for your specific exotic pet but that doesn't mean that a vet that doesn't go through the specialization process isn't just as capable. In the United Kingdom they are referred to as veterinary nurses but in the United States they are called veterinary technicians (but that may change). Veterinary technicians may be referred to as registered, credentialed, or licensed depending on the state they work in. Just like veterinarians, vet techs can work with any species and in any field of medicine but specialties do exist. Unfortunately, each state has drastically different laws regarding what a vet tech can and cannot do, calls themselves (RVT, LVT, or CVT), and what type of schooling and continuing education is required. There is a lack of national credentialing standardization which the National Association of Veterinary Technicians (NAVTA) is battling. Vet techs, in most states, must complete either a 2 or 4 year college degree in Veterinary Technology from an approved school and then pass the Veterinary Technician National Examination (VTNE). Depending on which state they work in they may or may not have a separate state examination. Some states do not even require that the vet tech passes the VTNE or have any credentialing body that oversees the technicians. For those states that do, the vet tech then needs to acquire a certain number of continuing education credits (just like vets) in order to renew their license or registration. 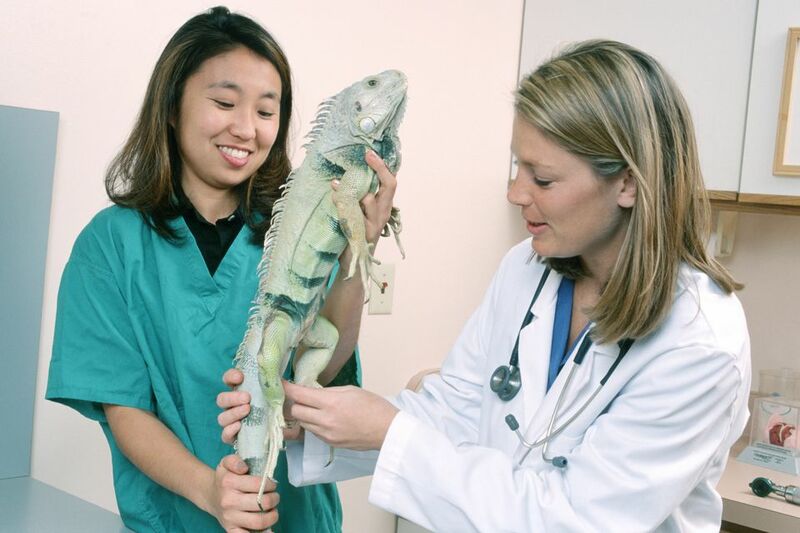 There is only one specialty for vet techs that want to become specialized in exotic pets and that is through the Academy of Veterinary Technicians in Clinical Practice. The AVTCP offers an avian/exotic category as a specialty for credentialed vet techs and the process is lengthy. The application includes case studies, case reports, work history proof, letters of recommendation, and more and if this application is accepted they are then allowed to sit for the examination to prove their knowledge. With or without this specialization, vet techs are the backbone of an animal hospital (much like human nurses). They draw blood, obtain radiographs, educate clients, perform anesthesia, and more on many kinds of exotic pets. Many other support staff members are employed by exotic pet veterinary hospitals including assistants and aides. These important team members are typically responsible for patient restraint and cleaning but some states allow on the job trained individuals to do the same duties as a vet tech. There is also a certification program for veterinary assistants but it is not legally required in order to work as a vet assistant or aide. Many young animal lovers choose to work at a pet store so they can be surrounded by what they love. But working in a pet store isn't just for high schoolers. Many exotic pet lovers make a career out of working with the variety of exotic pets found in both corporate and privately owned pet shops. Some even choose to open their own pet store after having worked in one for someone else. Some rescue groups have educational programs using their exotic pets but other people also start a business by educating others on exotic pets. Some people rescue these exotic pets and others purchase them, but they all go around to different events (birthday parties, etc.) and let their clients touch and learn about the animals. If you're not needing a paycheck or just want to give back there are plenty of opportunities to work with exotic pets. Rescue facilities are almost always in need of able bodies to clean and care for their rescued pets. Some facilities take in all kinds of animals while others are specific to certain species. There are rescue groups and sanctuaries for almost every kind of exotic pet and they most likely need volunteers. Many other jobs exist that allow you to work with wild exotic animals, wildlife, and laboratory animals. If you enjoy working with primates, rabbits, and rodents (and you can handle potentially having to euthanize the majority of your patients) then you should consider a career in a laboratory or research setting. Doctors, vet techs, lab techs, and others are all employed by various kinds of laboratories and universities. Entry level positions abound for people willing to clean cages and compared to many other animal related jobs, the pay and benefits are good. If you want to get close up and personal with captive wild exotic animals a myriad of careers exist in zoos, nature centers, aquariums, and other facilities. Nature centers and science centers often employ people with a Bachelor's degree in biology but opportunities for front desk staff and cleaning personnel may also exist. Zoos, aquariums, and safaris typically employ people with a Bachelor's degree in zoology or biology (and are highly competitive) but some smaller facilities (or privately owned facilities) may still hire on the job trained individuals. Jobs in gift shops, at the front desk, or cleaning stalls and enclosures may be available to untrained people looking to work in an environment that has animals but still be content not working directly with them. The work can be hard, the emotions can be all over the place, and the pay is usually low. But for exotic pet lovers, it's all worth it when they are able to spend their work week doing what they love. If your goal is to work with exotic pets then it may not be easy but you'll succeed eventually if you don't give up. Be willing to start in an entry level position doing the dirty work and if you work hard you'll get to where you want to be.